The world provides enough food for all, but more than 800 million people around the world face chronic hunger. We believe in a God of abundance, so as a church, we live out our call in baptism to strive for a just world where all are fed. ELCA World Hunger is our church’s ministry to end hunger and poverty. We walk alongside our partners and companions in the US and more than 60 other countries. 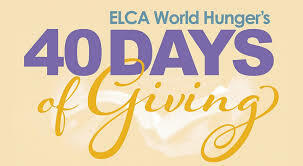 Your gifts to ELCA World Hunger address hunger and poverty around the world with creative and courageous action. This Lent, you are invited to join together with fellow supporters to study, reflect, and give during ELCA World Hunger’s 40 Days of Giving. Experience how the grace of Christ moves us to engage in transformative works of love around the world as God calls us into the ministry of hope, liberation, and restoration for our world. Give Today: Mail — Make your check payable to “ELCA World Hunger” and write “40 Days of Giving” on the memo line. Place your check in the offering plate or mail to: ELCA, P. O. Box 1809, Merrifield, VA 22116-8009.